But I do love Mimle. Even when she is a little troll. 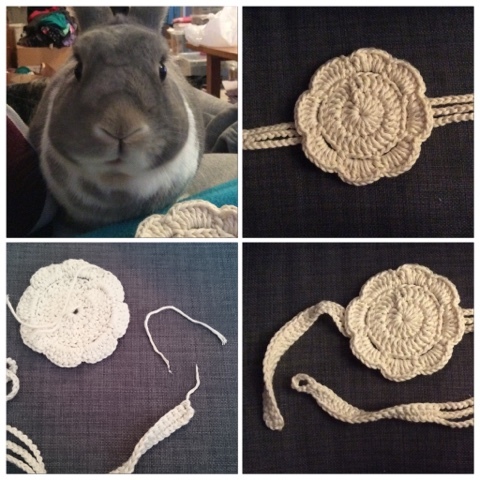 So here is my sort of finish, it needs a bead in the middle of the flower and then sewing it to the headband. I think it looks good, it is for a birthday girl so I feel lucky Mimle left enough yarn for me to sew in the end. so now the baby can come. 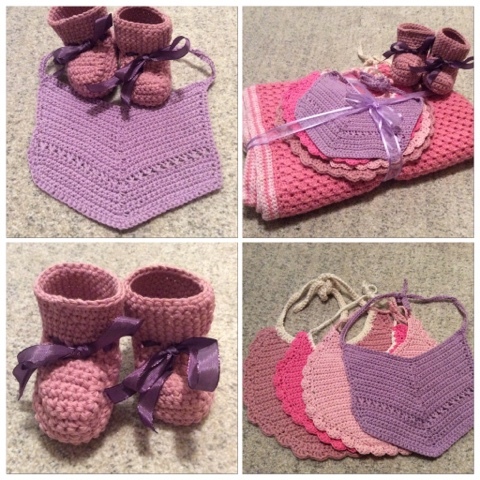 I am not sure how much yarn I have used up, the booties was made in Drops Paris Cotton and I used 45 grams, each of the three bibs weighed around 15 grams and I used Søstrene Grene yarn. So so far I have used up 90 grams of yarn on baby-things in this bundle. I have already counted the blanket. The first bundle I made four bibs, but it is only the green which was finished in May and haven't been counted yet. That also weighed 15 grams. And then there is the flower headband, that weighed 14 grams. So May so far has been 119 grams, or a little over two skeins of yarn out.